A smelly, "guacamole-thick" muck is fouling a stretch of beaches promoted as Florida's "Treasure Coast." Florida Governor Rick Scott declared a state of emergency last Thursday as blooms of toxic algae plagues beaches along the state's Atlantic coast. 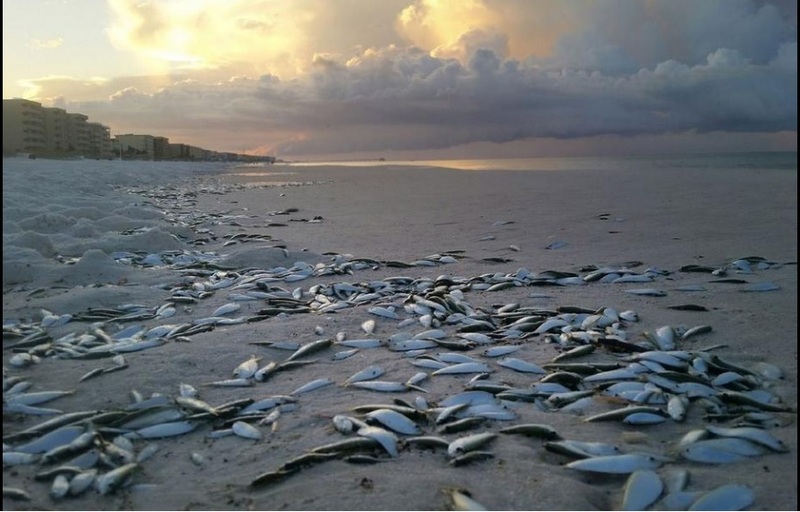 However Florida Fish and Wildlife Conservation Commission are not blaming algae blooms for the death of thousands of fish which have washed up along the beaches of Okaloosa Island. Thousands of dead fish litter a beach on Okaloosa Island, Florida, reports the nwf Daily News. Bekah Nelson, spokeswoman for Florida Fish and Wildlife Conservation Commission, said that the agency took samples earlier in the week but did not find any blooms. Some fish kills are the result of natural events. Fish kills can occur when there is too little oxygen in the water. Environmental factors such as weather patterns, water temperature, depth and quality, amount and type of plant growth, fish community structure, along with the presence of viruses and bacteria can all be triggers. In Florida, most dissolved oxygen-related fish kills occur in the warmer months from May through September, although it’s possible that it can occur in winter.